Interested in Traveling to Mexico with FHS Spanish Teachers? There is still room for the Mexico 2019 trip with FHS Spanish teachers! Join us in July as we explore Mayan ruins and Mexican culture! Students receive three (3) college credit hours! Contact dengel_a@fairfieldcityschools.com for more information. The 2017-2018 FHS Yearbooks Are In! All pre-ordered books can be picked up at the high school between the hours of 1:45 and 3:00 p.m. Monday-Friday in rooms 1405 or 1403. There are also a small number of extra '17-'18 yearbooks that can be purchased for $75. Siblings may pick up yearbooks. Yearbooks for previous years may also be picked up at this time. This does not include the Freshman School yearbook. Freshmen already have their 2017-18 book and any questions about the freshman books should be directed to Colleen Larbes at larbes_c@fairfieldcityschools.com. Parents may contact high school yearbook advisors at thatcher_t@fairfieldcityschools.com or montgomery_m@fairfieldcityschools.com. All artwork will be on display at the Art Academy of Cincinnati beginning Monday, January 28th through Friday, February 8th. Recently, there has been some discussion about our transportation services, policies, procedures, and state law as it relates to our transportation services. The purpose of this communication is to address some of the concerns that have been shared as well as make some clarifications about our practices and procedures. First and foremost, we want our parents to know that the safety of our students is always our most important priority. Our commitment to safety applies not only in our school buildings but certainly extends to our transportation services as well. As a district, we are very fortunate to have bus drivers that take the time to get to know their students personally and provide a safe and secure environment while transporting a large number of students. It is very common for us to receive questions about combining bus routes. We only combine bus routes when it is absolutely necessary. As you may or may not know, there is a shortage of bus drivers and substitute bus drivers locally and nationally. Our Human Resources department has worked hard to recruit and retain quality employees to transport our students, but we continue to experience a shortage for these critical positions. As a result of these shortages, it has become necessary to combine bus routes. However, we do want you to know that this only takes place when the regular bus driver is not available and we are unable to secure a substitute bus driver. The practice of combining bus routes has been and will continue to be a last resort. Unfortunately, due to the continued expected shortage of drivers, this practice will continue to be utilized when necessary. When routes are combined, we often receive numerous questions such as: What is the capacity of our buses? What is the legal limit of students that may be transported on our buses? How many students are legally permitted to sit in a seat? Are students asked to stand or sit on the floor on our buses? Our buses have the capacity to legally hold up to seventy-two passengers, which may result in three students riding in a seat. At no time is any student asked or permitted to be seated on the floor or stand. If a student believes that a seat is not available, he or she should notify the bus driver immediately. If the driver discovers that there are not enough adequate seats for every student on the bus, we want to assure our students and our parents that we will make other arrangements for students to be transported. It is not acceptable for any student to stand or sit on the floor. As a result of these most recent concerns, we have asked our drivers to have a heightened sense of awareness in regard to students attempting to sit on the floor or stand. In conclusion, we want to reinforce our commitment to providing a safe and secure environment for our students, regardless if they are in one of our buildings or on one of our buses. We hope that the information in this statement is helpful for our families. We want our parents / guardians to be confident that the safety of their children is our most important priority. If you should ever have a question or concern about the safety of your child on one of our buses, please contact our transportation department at 513-829-6603. 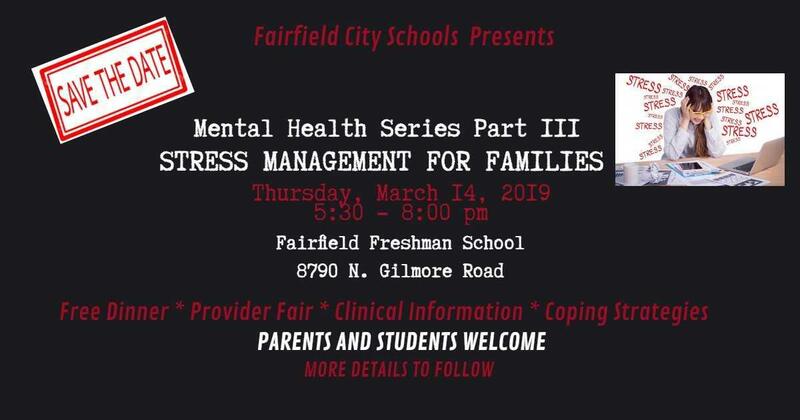 Please save the date for the next FCSD Mental Health Series Part III - Stress Management for Families on Thursday, March 14, 2019. This FREE event is open to the public. Details to come. Effective January 7, 2019, the District changed online payment systems. The new online system is PaySchools Central. Parents must re-register under PaySchools in order to pay student fees and add money to student(s) lunch accounts. Balances in SPSEZPay as of January 7, transferred to the new online PaySchools system. For more information on how to register with PaySchools please click the attached file. 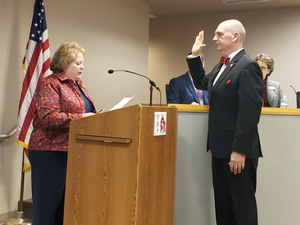 Congratulations to Michael Berding and Dan Hare, who were appointed to serve as president and vice president, respectively, on the Fairfield Board of Education. The board also set meeting dates for 2019 during its organizational meeting on January 10. Click the headline above to read more. I. Recruit, hire and retain teachers, administrators and staff of color. II. Increase cultural awareness of all students, teachers, administrators and staff of the FCSD. III. Increase community engagement and parental involvement. IV. Increase student engagement and learning opportunities to emphasize the value and importance of the participation of diverse students in all curricular and extracurricular activities. Members of the ACT-SO (African-American Cultural and Technical Scientific Olympiad) class at the high school shared feedback on the new class and projects they are working on for local, regional and national competition. 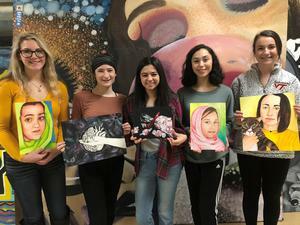 Projects include sculpture, painting, photography, biology, dermatology research, playwriting, poetry and entrepreneurship. The ELT is also expanding the scope of the plan to reach students with disabilities and special needs, economically disadvantaged students, and individuals with mental health needs. To view the presentation, please click the link above.